Got a chance to try some of Are You Red-dy? 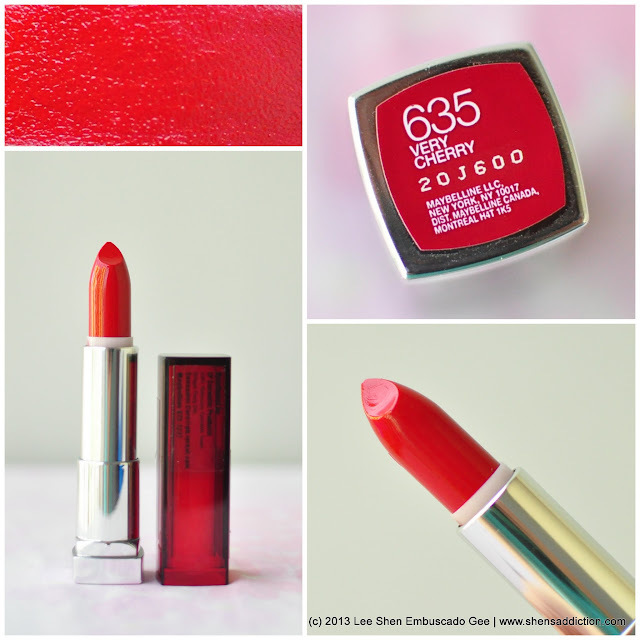 by Color Sentional Lasting Lip Color by Maybelline. Encased in a crimson bejeweled-like casing, I was impressed immediately. I love it when drugstore brands up the ante when it comes to packaging. If you're curious to find out how they fare, read on. But of course, what's more important for me is the quality. And at Php399 a pop, Color Sentional has always proven to be a good buy. I've tried a few of their Color Sentional lipsticks (the ones in the old packaging) and I've always love the glide of it. Yes, it's got good pigmentation, you're sure to get what you see on the tube and it's moisturizing, too. I'm glad they are widening their color selections, too. This time to in the family of rubies and corals, shades that definitely compliments Pinay skin. The satin-shine consistency is definitely great for those with thin lips. It immeidately adds dimension with out having to use any lipgloss. As more us ladies with lips like pillows, get rid of it by dabbing the shine off with an oil-control blotter or tissue. Easily build up color, too, by doing the swipe and blot process about 3 to 4 times. 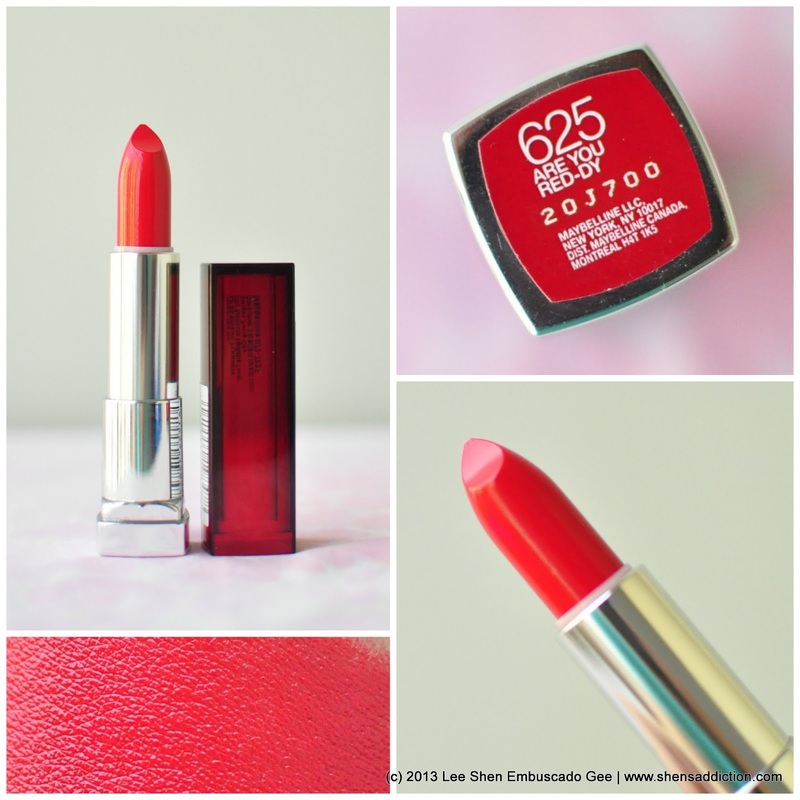 Another thing to love about Maybelline's Color Sentational lipsticks are the size and amount of product you get. The bullet is significantly taller and circumferentialy wider compared to its competitors of the same proce range. And there's obviously put more thought in the packaging. Red Revival is a classic red with a hint of soft brown and blue-tint on it. Great for recreating Marilyn Monroe inspired makeup look. 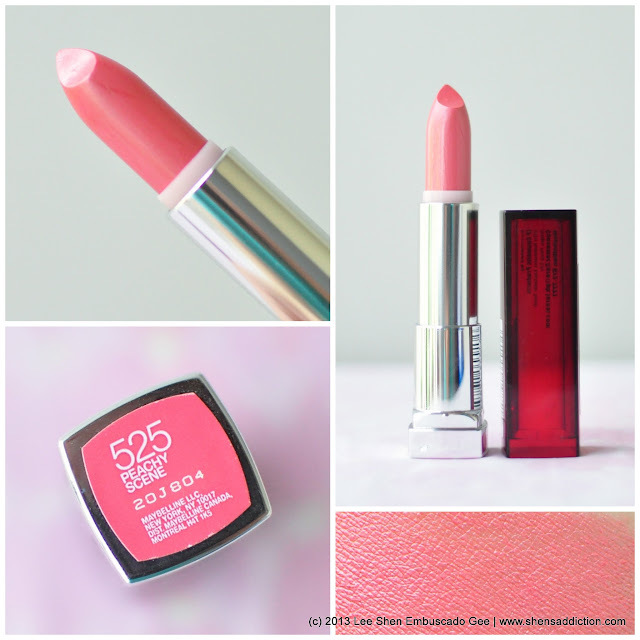 Great for ladies with full lips and almost all skintone especially those on the morena side. Very Cherry is a statement lipstick. A bright red shade with a hint of blue and orange that melds well together to create a flamboyant color. This shade will immdiately grab attention, the one you'll like for sure. Although not everyday kind of lipstick for me. I love that it adds character to the wearer. 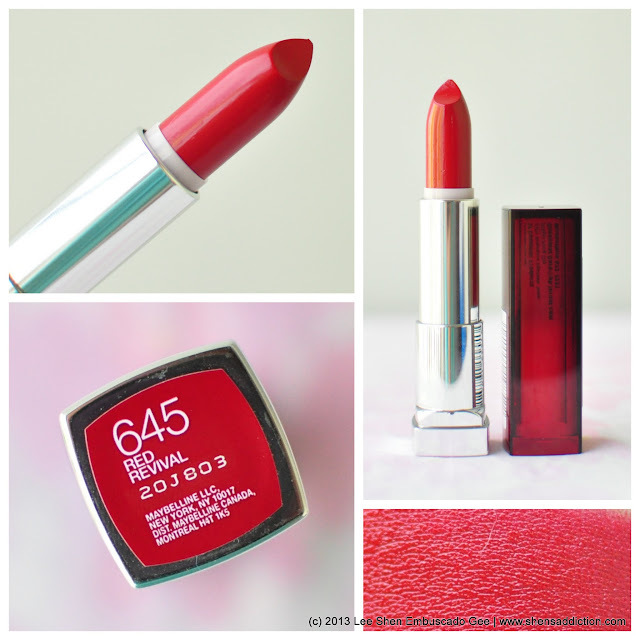 Are you Red-dy is a muted blue based red lipstick. Almost pastel if you ask me. It's a great everyday wear and could match almost all kinds of skintone. 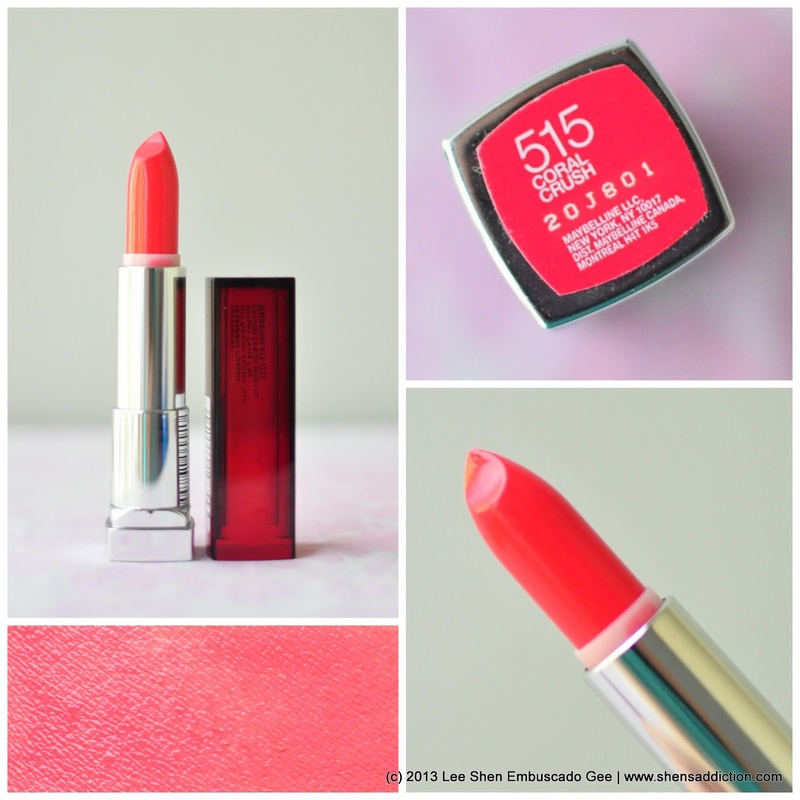 Coral Crush is a bright peach pink lip color that is certainly suited for summer looks. one that can enhance your pastel-inspired outfit. It's not something that I think I would wear everyday as I find that this doesn't suit my skin. but this is definitely great for those with uber fair skin. My friend, Sophie, will definitely rock this look. Peachy Scene is more pink than its name. That much is pretty obvious. The frost did turn me off. But upon rough-swatching it on my lips, I find that this reminds me a lot of MAC Bombshell it being pink and frosty. Not something a lot of us would choose for sure, but great to have especially for deep smokey eyes makeup look. 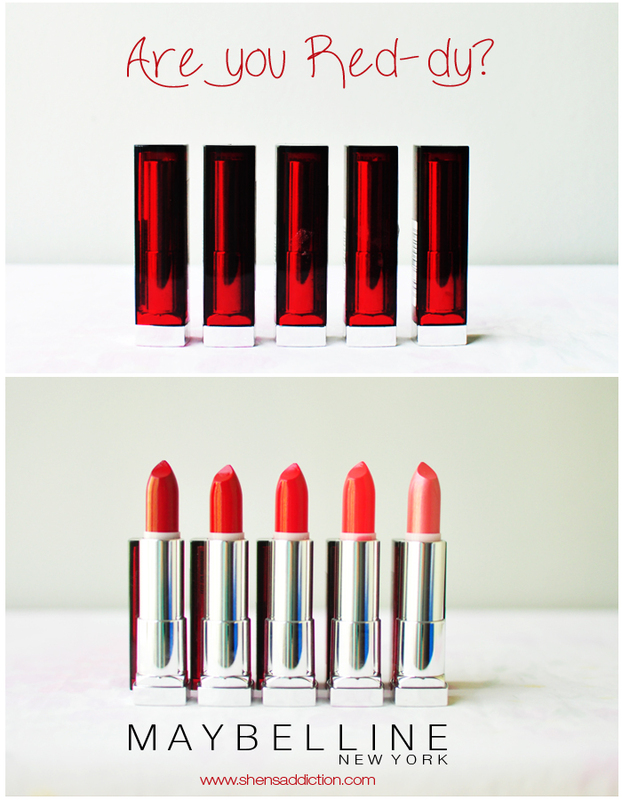 When it comes to rocking red lipstick, there's only a few things that you need to think about. Make sure that you focus the look on your lips. Cover up those baggies around your eyes and blemishes for a smooth looking skin. Nothing like a pimple to distract people from admiring your blood red lips. Accentuate your eyes with a long wearing eyeliner. I prefer gel liner for it's staying power and winging it out is much easier. It livens up the eyes and the black contrast is great with the red lippie. Awaken your eyes further with mascara and coat those lashes. Red revival is the best-est! I have it. Perfect sya for people with yellow undertones, the blue tint makes the red really pop out. Anyway, would you know kung meron silang reddish pink color? Coral Crush looks really cute! The colors looks super opaque *~* I've been meaning to try these out! I love the shade of Peachy Scene. Not so loud. I would love to try Revival. In fairness, Ms. Shen, mura lang sya ano? the problem i usually have with their lipsticks is that they don't last long or are not pigmented enough :( these look great though! As you said that red revival fits morena girls. I think I'll be getting one. :D Thankyou Ms.Shen!